This is the deepest X-ray image ever obtained, made with over 7 million seconds of observing time with NASA’s Chandra X-ray Observatory. These data give astronomers the best look yet at the growth of black holes over billions of years beginning soon after the Big Bang. 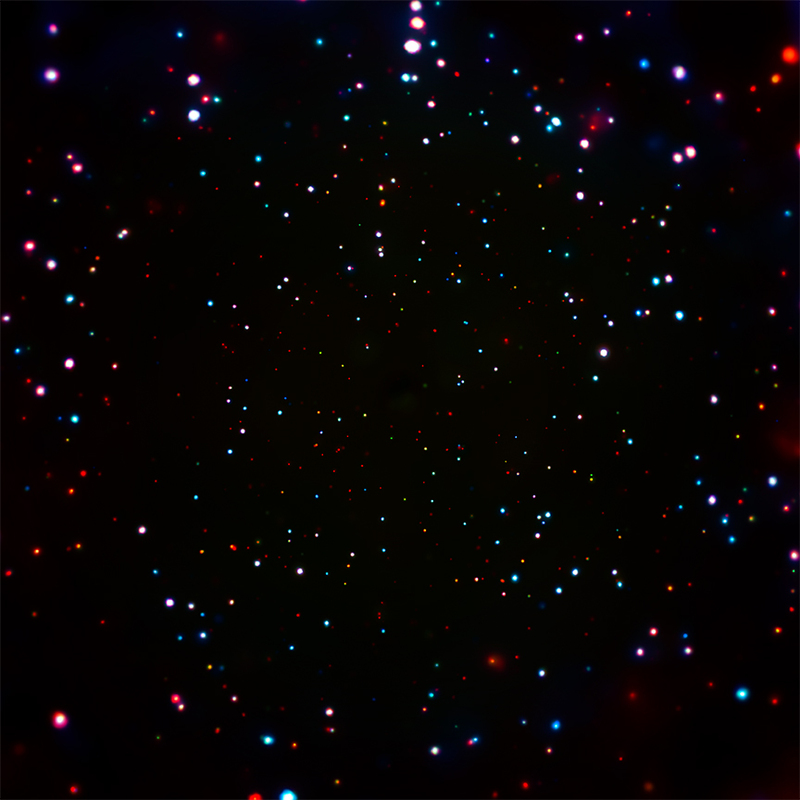 Image Credit: X-ray: NASA/CXC/Penn State/B.Luo et al. January 5, 2017 – An unparalleled image from NASA’s Chandra X-ray Observatory gives astronomers the best look yet at the growth of black holes over billions of years beginning soon after the Big Bang. This is the deepest X-ray image ever obtained, collected with about 7 million seconds, or eleven and a half weeks, of Chandra observing time. The image comes from what is known as the Chandra Deep Field-South. The central region of the image contains the highest concentration of supermassive black holes ever seen, equivalent to about 5,000 objects that would fit into the area of the full Moon and about a billion over the entire sky. “With this one amazing picture, we can explore the earliest days of black holes in the Universe and see how they change over billions of years,” said Niel Brandt of Pennsylvania State University in University Park, Pennsylvania, who led a team of astronomers studying the deep image. About 70% of the objects in the new image are supermassive black holes, which may range in mass from about 100,000 to ten billion times the mass of the Sun. Gas falling towards these black holes becomes much hotter as it approaches the event horizon, or point of no return, producing bright X-ray emission. The new ultra-deep X-ray image allows scientists to explore ideas about how supermassive black holes grew about one to two billion years after the Big Bang. Using these data, the researchers showed that these black holes in the early Universe grow mostly in bursts, rather than via the slow accumulation of matter. The scientists have also found hints that the seeds for supermassive black holes may be “heavy” with masses about 10,000 to 100,000 times that of the Sun, rather than light seeds with about 100 times the Sun’s mass. This addresses an important mystery in astrophysics about how these objects can grow so quickly to reach masses of about a billion times the Sun in the early Universe. The researchers also detected X-rays from massive galaxies at distances up to about 12.5 billion light years from Earth. Most of the X-ray emission from the most distant galaxies likely comes from large collections of stellar-mass black holes within the galaxies. These black holes are formed from the collapse of massive stars and typically weigh a few to a few dozen times the mass of the Sun. To perform this study, the team combined the Chandra X-ray data with very deep Hubble Space Telescope data over the same patch of sky. They studied X-ray emission from over 2,000 galaxies identified by Hubble that are located between about 12 and 13 billion light years from Earth. Further work using Chandra and future X-ray observatories will be needed to provide a definite solution to the mystery of how supermassive black holes can quickly reach large masses. A larger sample of distant galaxies will come from observations with the James Webb Space Telescope, extending the study of X-ray emission from black holes out to even greater distances from Earth. These results were presented at the 229th meeting of the American Astronomical Society meeting in Grapevine, Texas. A paper on black hole growth in the early Universe led by Fabio Vito was published in the August 10th, 2016, issue of the Monthly Notices of the Royal Astronomical Society. A survey paper led by Bin Luo was recently accepted for publication in The Astrophysical Journal Supplement Series.